In 1982, Midnight Oil was a band in trouble. Their last album, Place Without a Postcard, was supposed to be their big breakthrough but it hadn't worked out that way. So they found themselves in London, feeling the pressure of recording what was a "make or break" album. Members threatened to leave, others had nervous breakdowns and the ANZ bank manager back home was sweating as he watched the overdraft he'd approved for the band get bigger and bigger. If this album went the same way as the last one, it could be the end of Midnight Oil. Out of the crisis came 10,9,8,7,6,5,4,3,2,1, an album that changed everything for the band. It entered the charts and stayed there for more than three years. They started playing bigger venues - and they were able to pay back the bank manager. Two years later, they headed to Japan to record the polarising Red Sails in the Sunset. It managed to do what 10-1 couldn't - give the band their first No1 album. But again the band found themselves facing the possibility it could all be over, courtesy of lead singer Peter Garrett's tilt at federal politics. If he wins, the band loses. In Sounds Like an Ending, journalist and author Glen Humphries takes a track-by-track look at these two albums and the times and turmoil that fuelled them. 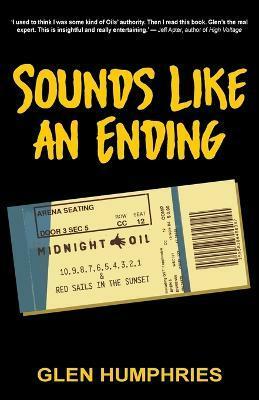 That includes wondering whether the 10-1 title was a sly dig at a certain Australian music TV show, finding out the stories behind some of the songs and explaining what's really happening on the cover of Red Sails in the Sunset. "I used to think I was some kind of Oils' authority. Then I read this book. Glen's the real expert. This is insightful and really entertaining." "This is intelligent, insightful and at times dryly amusing writing that does what the finest commentary should by brilliantly putting the music in the context of the life, times and events surrounding its creation and - most importantly - dragging you back to the recordings and songs armed with fresh insights."